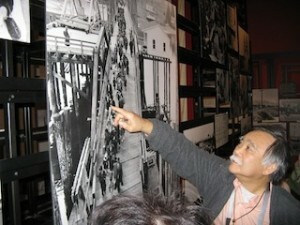 Frank Kitamoto points to himself as a young boy walking with his family and the rest of the Bainbridge Island Japanese American Community onto the ferry at Eagledale Dock on Bainbridge, March 30, 1942, as they were forced from their homes and shipped to concentration camps during WWII. It is with a heavy heart that we mourn the loss of Frank Kitamoto, a pillar of the Bainbridge Island community, a human rights champion of champions, and tireless community leader. Dr. Kitamoto passed away March 15, 2014. Frank Kitamoto was a prominent, principled and dedicated voice on the Japanese American experience of exclusion and its significance to our modern age. He helped us as a community to collectively bear witness to a period of tragedy, locally and globally. Without his leadership, determination, and fierce sense of humanity, most of what we know and now stands to carry forward the legacy of exclusion on Bainbridge Island might not have come to be. It would be fair to say that every oral history project, major book, documentary, feature film, exhibit, educational program, and memorial regarding the Bainbridge Island Japanese American Experience, had behind it his leadership, consultation or guidance. Our Only What We Can Carry project would not have gotten started nor endured this long if not for Frank’s support and mentorship. He was our first lead advisor, and was the major source of inspiration in creating our Bainbridge Island Delegation to Manzanar concentration camp, where he and the Bainbridge Island Japanese community were first incarcerated. 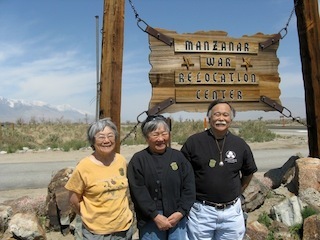 Frank helped to lead our first three delegations, 2009 – 11, and helped us build bridges to the local Japanese American community and a cadre of “elders” and wisdom keepers who have accompanied local educators and community leaders on these journeys of bearing witness and discovery. (R-L) Frank Kitamoto, sister Lily Kodama and cousin Hisa Matsudaira on our 2010 Delegation to Manzanar. His greatest contribution may be his work to help us embrace the Japanese American experience as a Bainbridge Island story, an American story, and story for all of humanity. Frank was a compassionate rebel, energized by anger and motivated by love, who faced down tremendous adversity to keep history alive, so that it may never happen again. He gave us the tools to take a stand against intolerance, hate, exclusion and injustice. His life’s work, his calling, and his passion, was about calling out injustice, overcoming differences, and healing people and communities. Dr. Kitamoto was the Martin Luther King, Jr., Caesar Chavez, and Ernesto Cortes of the Bainbridge Island Japanese American Community. He took a stand to make a part of history that had not been addressed publicly or privately for four decades, and led the way to normalize and make integral a subject that is now an enduring part of the culture of our community and schools, and our Island’s identity. We are a better community and people because of his righteous determination. It has been one of the greatest honors of my life to know and work with Frank. As a visionary and connector, he left many indelible marks on his community as well as those, like me, whom he inspired. Frank is a local hero for our time. He was tireless in the way he served his community. Now it’s time for us to step up and fill the love-filled, resilient shoes that Frank Kitamoto left for us to walk in. 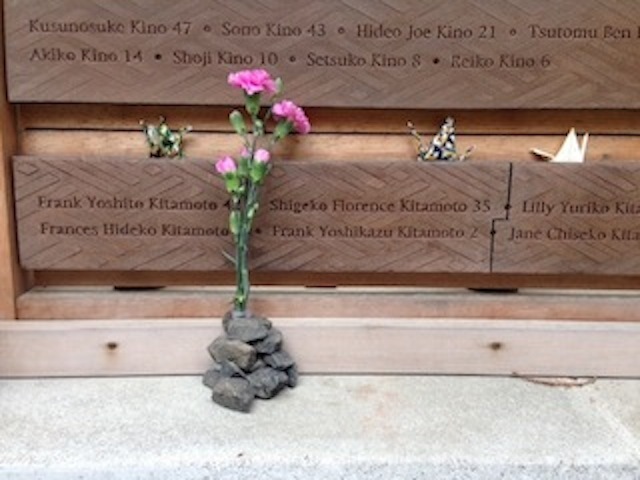 A tribute left in honor of Frank Kitamoto at the Japanese American Exclusion Memorial, Bainbridge Island.